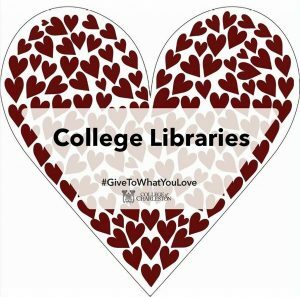 Show your Library love this Valentine’s Day with Give To What You Love! With five different initiatives across the College Libraries, there’s an opportunity for all alumni, parents, students, faculty, staff and friends to connect their philanthropy to their particular library passions. With your help, we can reshape the first floor of the Addlestone Library to better facilitate group learning and showcase rotating exhibits of Special Collections materials. By building a series of dynamic seating arrangements, you can help prepare our students to lead presentations as well as future colleagues. By embedding premier exhibition space into this collaborative work space, your gifts have the power to connect the College’s past, present, and future. Your gifts to the College of Charleston Libraries can empower students and lifelong learners of every discipline and background. You gave them a place to focus, research, and learn. Now, you can inspire them to imagine, create, and collaborate. Through your support, we can offer access to the latest digital media tools and interact with our collections in new ways. Every department in Addlestone Library is directed by women. From student research orientations to award-winning digital humanities initiatives, our female leadership is reflected in all levels of the Library. As the College marks the centennial of its first female student, join us as we celebrate the Year of Women. Your gifts will help us host leading female voices and spotlight women’s history across the Lowcountry. You can make history by preserving it. The Library has launched an effort to document LGBTQ life—past and present—in the Lowcountry by collecting everything from personal papers to oral histories. Funded initially by a generous grant from the Gaylord and Dorothy Donnelley Foundation, help us make this project a permanent resource and ensure the Libraries’ collections reflect the stories—and the love—of ALL Charlestonians. You can help chart a course in righting the wrongs of the past. In 2015, The College of Charleston’s Avery Research Center and campus partners launched the Race and Social Justice Initiative (RSJI). Initially funded by Google, you can continue RSJI’s efforts by making a gift today. Your support will help engage the community in dialogue and action around historic and ongoing racial and social injustice in Charleston, SC.